VOB (Video Object) is the container format in DVD-Video media which can contain digital video, digital audio, subtitles, DVD menus and navigation contents multiplexed together into a stream form. The VOB format is based on the MPEG program stream format to keep the file sizes down. VOB file with .vob extension can be located in the VIDEO_TS folder (ISO, IFO included) at the DVD root. In other words, files in VOB format may be encrypted that can't be well supported by the built-in media players on Windows such as Windows Media Player. Here we need a powerful player, equipped with a DVD decoder and many other required decoders, to playback any data in VOB without any trouble. 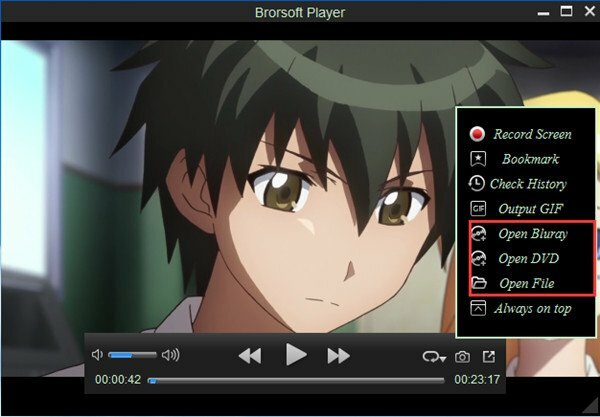 Brorsoft 8K Player is a powerful media player which plays VOB files on both Windows 10/8.1/7 and Mac OS, no matter the original file is compressed with MPEG or H.264. This VOB player is embedded with 450+ video codecs and 180+ audio codecs, saving you the hassle of finding and downloading any codec pack. It is indeed a powerful VOB Player when playing DVD VOB movies and online VOB videos on Windows 10/Mac. It can smoothly play digital video, digital audio, subtitles, DVD menus, etc contained in VOB. Although VLC claimed that the encrypted VOB files on DVDs could be read exactly by VLC media player as it can find where the decryption codes are and well handle the encryption programs written specifically for DVD playback, users still encountered issues while playing VOB files from DVD disc via VLC. MPlayer may not be the most attractive player in the world, but like in VLC Media Player, this little app hides a great potential under its dull design. It is a simple yet great media player that supports more than 192 video and 85 audio codecs natively, which means it'll probably be able to open just about anything you throw at it, definitely including VOB files. From the list of best 3 free VOB Player software review, you may have decided which VOB player is the best for you to manage and play your .vob or DVD VOB files. Enjoy!